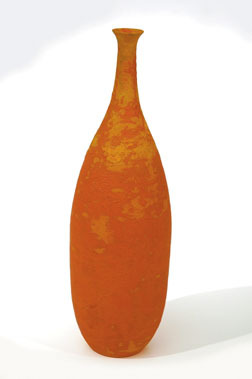 Above is James Haggerty's "Large Vase, Orange Ruckle, 2008." Below is "Vase, Gold Chap, 2008." Where: Sullivan Goss, 7 E. Anapamu St.
Few people figure out what they're going to do with their lives in their teenage years, but artist James Haggerty was only 12 years old when he began the journey down his career path. Quite appropriately, this happened on a path. During high school he tried to get a job at Santa Barbara Ceramic Design, but the owner told him to wait until he graduated. The day after graduation, Haggerty was in line for the job he was promised. "I worked there for a few years and that's where I met my wife, Linda," he says. Following some time at the California College of Arts and Crafts in Oakland, Haggerty transferred to the Otis Parsons Institute in Los Angeles where he got his Bachelor of Fine Arts degree. In 1989, he and a few colleagues were presented with an offer that rarely comes around to a ceramicist. "We were given the opportunity from Paramount Studios to develop a set for the movie 'Ghost.' We coached Demi Moore on the (potter's) wheel. That was a wonderful experience." Haggerty has been making waves in the community of ceramic enthusiasts in large part due to his revival of Persian Luster. Pioneered in the 1930s and '40s by ceramicists like the husband/wife duo Otto and Gertrude Natzler, this technique relies on intricate attention within the firing process. Utilizing a discipline known as strike reduction, Haggerty adds materials like eucalyptus wood when his kiln is at a certain state of cooling. When performed properly, this process evokes metallic properties and stunning textures in the glazes. One of the things people love about Haggerty's work is that nothing is ever the same. However, his bowls and vases create a parallel to ceramics of days long ago. Haggerty is the only modern invitee to the L.A. Pottery Show which, otherwise, focuses exclusively on work from 1880 to the 1920s. On display through October, this exhibit at the Sullivan Goss Gallery is his most prestigious yet. The first day e-mail announcements were sent out, the largest piece in the show was purchased by an Army Major currently stationed in Afghanistan. He warmed the artist's heart by explaining that browsing fine art online is the only thing enabling him to sleep at night. Whether surprising himself with new glazes or receiving recognition from collectors such as this, James Haggerty is never short on inspiration.